Investment decisions in electricity generation units, e.g. power plants, differ in several aspects from investments in the financial sector. In a simple approach, the combination of costs and revenues gained from a power plant can be seen as a portfolio of assets. However, the fixed and technology-specific ratio between input and output quantities (fuel consumption, electricity generation and carbon dioxide emissions) over the power plants life time result in a varying ratio between revenues and costs if the underlying prices (for fuel, electricity and CO2 permits) evolve differently. This can be interpreted as a time-varying share of assets in a portfolio, introducing also a time-variation of risk. For optimized investment decisions, both in respect to the choice of the technology as well as the optimal time, investors must take this fixed ratio into account in order to reduce the later costs for portfolio adoption. The aim of this research project is to adopt or develop models, which aid decision makers from industry to increase the company’s value as well as politicians in their task of setting a legal framework for such investments. The proposed models can either be based on the standard net present value (NPV) or on the real options (RO) approach. In the NPV model, the decision “invest” or “not” is solved for different states of the world and different technologies. Applying a technology- and state-dependent discount rate, an endogenous risk evaluation is possible. The RO approach additionally allows accounting for the value of waiting. In an applied study, we analysed the value of different power plants (gas-fired and coal-fired, w/o carbon capture and storage (CCS); hydro; wind; photovoltaics) and for taking into account technical change. We further investigate the influence of alternative CO2 policies on the plants’ values, modeling the CO2 price in three different ways and for three different carbon price levels (5, 25, 45€/tCO2): (1) as a stochastic process (Geometric Brownian Motion), reflecting the price development in the Emissions Trading Scheme of the European Union (EU ETS); (2) as a (constrained) stochastic process with a price floor, and (3) as a deterministic carbon tax. From the model application, using data from German exchange based markets and a much-cited pilot study on future energy strategies and scenarios in Germany, we find a strong preference for hard-coal power plants in the low CO2 price scenario (P2015 = €5) and a low value of waiting, irrespective of the CO2 price policy. In case of the moderate CO2 price scenario (P2015 = €25), the value of waiting is much higher for the CO2 permits with a price floor and the CO2 tax policy, leading to a dominance of the CCS. In contrast, for the simulated EU ETS market, the conventional fossil fuel-fired power plants dominate the other technologies. In the high CO2 price scenario (P2015 = €45), the value of waiting only delays the investment decision in the case of the floored CO2 permit prices. For the two other policies, the model predicts an immediate investment in CCS. 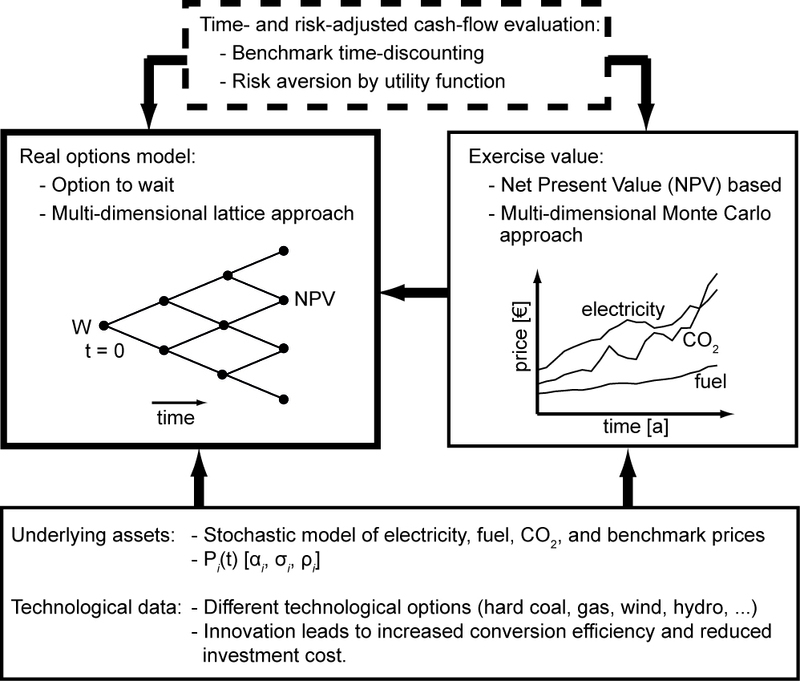 Rohlfs, W., Madlener, R.: Valuation of CCS-ready coal-fired power plants: a multi-dimensional real options approach. Energy Systems J., 2 (3-4), 243-261, 2011. Rohlfs, W., Madlener, R.: Investment decisions under uncertainty: CCS competing with green energy technologies, Energy Procedia 37, 7029-7038, 2013 Proceedings of the 11th International Conference on Greenhouse Gas Technology – GHGT-11, November 18th-22nd, Kyoto, Japan. Rohlfs, W., Madlener, R.: Multi-Commodity Real Options Analysis of Power Plant Investments: Discounting Endogenous Risk Structures. Energy Systems J., 5 (3), 423-447, 2014.